That’s because people tend to think of stevia as a diet product or a sugar replacement. Even though it is often marketed that way, green stevia is an herb with a wonderful flavor and a great many uses. If you are trying to kick a sugar addiction, stevia very well may help, but it should also be appreciated for the herbaceous, green, sweet flavor that is uniquely its own. After I gave birth to my son, my hormones got all messed up and I felt awful. I went to talk to my doctor about what could possibly be making me so tired, puffy, sluggish, and craving food all. the. time. I didn’t make any sense to me. I exercised regularly and followed the Canada Health guide for eating a balanced diet: everything in moderation, lean meats, a rainbow of fruits and vegetables, low fat, whole grains. I was doing everything right. I was shocked! I asked “Why didn’t you tell me this before? Can’t you do something about it?” She replied that what you do about it is what I was already doing: following a healthy diet and exercising regularly. Clearly, that was not working. So, three years ago, I changed my diet dramatically by cutting out all sugar: sugar, honey, maple syrup, and even fruit. Yes, even fruit. I also cut out anything that my body could easily convert to sugar: carbs. I cut out all grains and all starchy vegetables as well. I added more healthy fats into my diet, organic and grass-fed meats, and lots and lots of green vegetables. These changes made an enormous difference in how I felt almost immediately. At first I felt horrible. I was so sick and felt like I was going to die as I detoxed from sugar. But then, after a few weeks, I started to get much better. I had more energy than I’ve ever had in my life. I felt much lighter and less puffy. And I lost a ton of inflammation, which helped to reduce my chronic pain dramatically. The numbers showed why I felt so much better. When I first had my blood tested, it showed a very high level of insulin resistance, and I looked like I was well on my way to developing diabetes. Within 6 months of a sugar-free diet, I’d cut that number in half. Within a year, I had completely reversed the insulin resistance. And then my doctor asked me to teach her what I had done! It took a ton of willpower to cut out sugar for good. No sugar. At all. Not even on my birthday. Yup, that’s right, no birthday cake. Living sugar-free is not easy. Sugar is in absolutely everything. It’s part of every celebration and social gathering. And it’s the first thing that your body wants when you’re hungry. Your body knows to ask for that quick fix of something sweet so that it can give you a burst of energy. And it tastes so good. So, so good. I was committed to kicking sugar in all its forms so I could stop the cycle of insulin resistance and build a better life. I wanted to have the energy to be able to raise my son. And live a long life to see him grow up. Needless to say, cutting out sugar has been a lifesaver for me. But also needless to say, it can be a bummer to have to pass on your favorite treats. I looked into how I could use something herbal and natural to create recipes that I loved that don’t replace sugar, but are even better. That taste delicious, sweet, and green – just how I want to live my life! That’s where stevia comes in. There used to be controversy around stevia, particularly in the United States where it was banned because there were not enough studies to say whether or not it was safe to consume. Even products like aspartame and other artificial sweeteners (oh, and sugar) were deemed safe to be sold on the market. I won’t go into the politics behind sugar and sweeteners because there are more than enough resources out there to shed light on those issues. I can only speak to how everything that I do for my own personal health and the health of my family has to make sense and feel good to me. 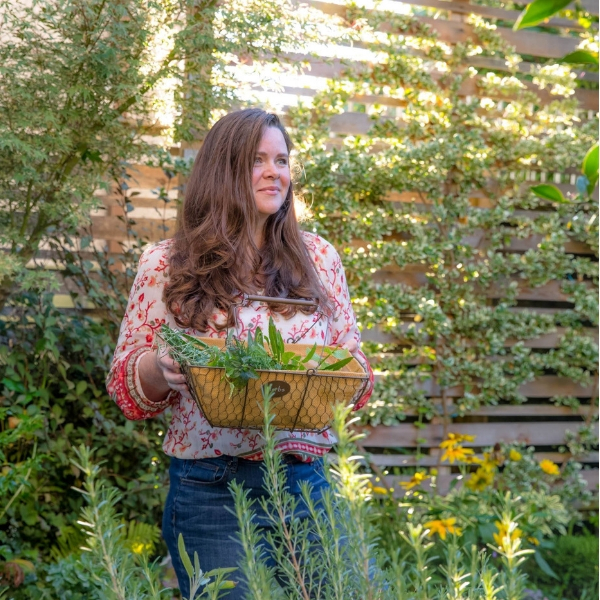 When I can grow an herb in my garden organically, I have a lot more trust in its safety than I do in man-made or synthetic products. When I first tasted stevia it was in a powder form from a packet and it tasted quite bitter and very sweet. Honestly, I did not like it at all. 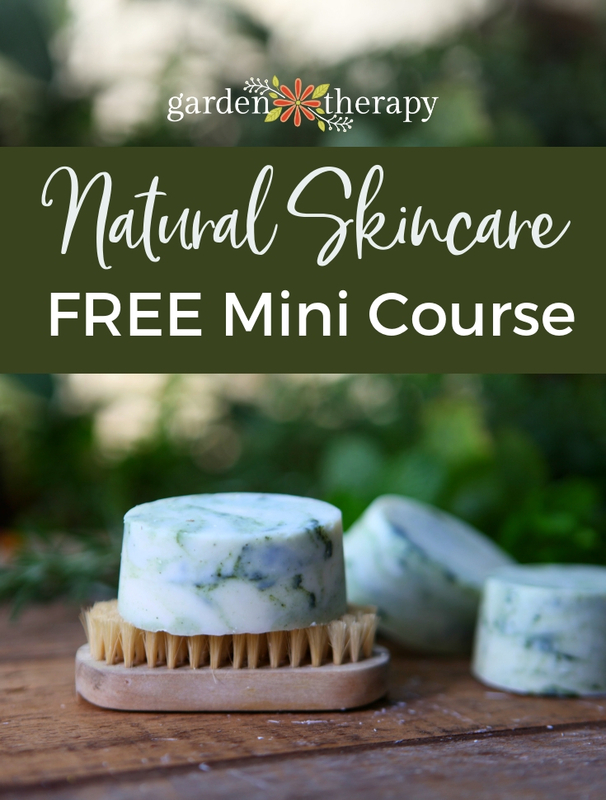 But when I started growing stevia in my garden I experimented a lot to find the ways that it could help me feed my sweet tooth while doing good things for my body. As an artificial sweetener, stevia is often either a clear liquid extract or a white powder. Essentially what’s been done is the sweet component of stevia has been extracted and added to either a powder or a liquid like alcohol or glycerin so that it dilutes the sweetness and helps to remove some of the bitter aftertaste. Green stevia, or Stevia rebaudiana, is what you’ll grow in the garden. It grows like an herb with serrated-edged leaves and is native to South America. Indigenous peoples of South America have used stevia for hundreds of years, both medicinally and as a sweetening agent. The flavor of green Stevia reminds me a bit of green tea mixed with sweetener. It is quite sweet, so a little goes a long way. 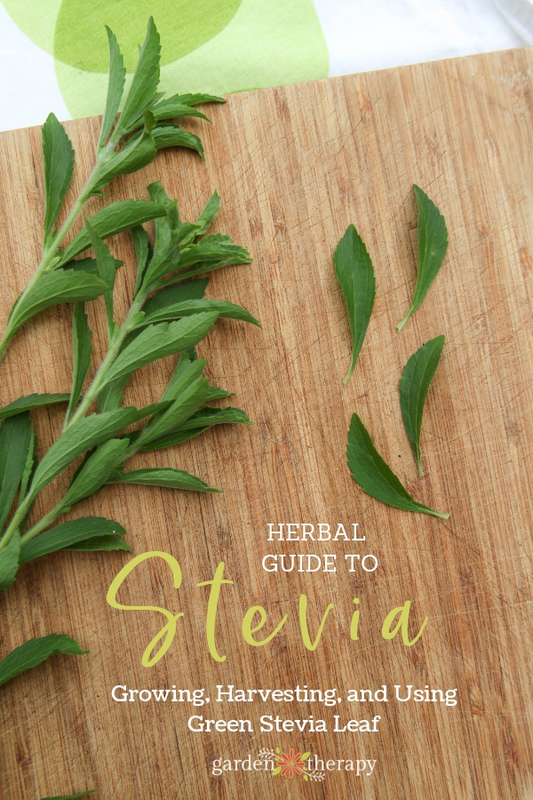 Over the past three years that I have been growing and testing out Stevia in various recipes I have learned how to harvest and prepare it so that I don’t miss sugar one bit. And, more importantly, Stevia helps me to stay away from sugar so that I don’t fall off the wagon. Grow green stevia in full sun in containers or in loose, loamy, well-draining soil. Space plants 18” apart so they can fill out and grow 12-36″ tall. Like basil, if you continue to pinch the plant back and use the top leaves it will become bushier and fuller with stronger stalks. Stevia can be grown from seed in the winter or from rooted cuttings. Stevia plants are now usually available at your favorite garden center in the herb section. Green stevia can overwinter in zones 8 and above, although the older the plant, the tougher the leaves become. It’s better to start new cuttings or new seeds each year for the freshest stevia. 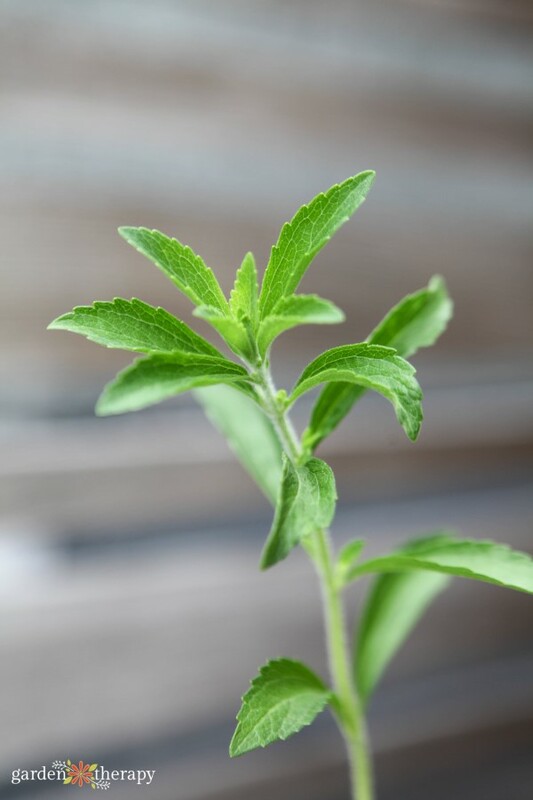 Prune back your stevia plant a few times throughout the growing season to prevent flowering and to encourage branching. Once the plant flowers, the leaf flavor becomes less appealing. Similar to most herbs and vegetables that you eat for their leaves, once the plant energy starts to go into flowering, the leaves become bitter or less flavorful. If you prune back your stevia plant a few times in the year, you’ll have plenty to use fresh and in recipes throughout the summer months. 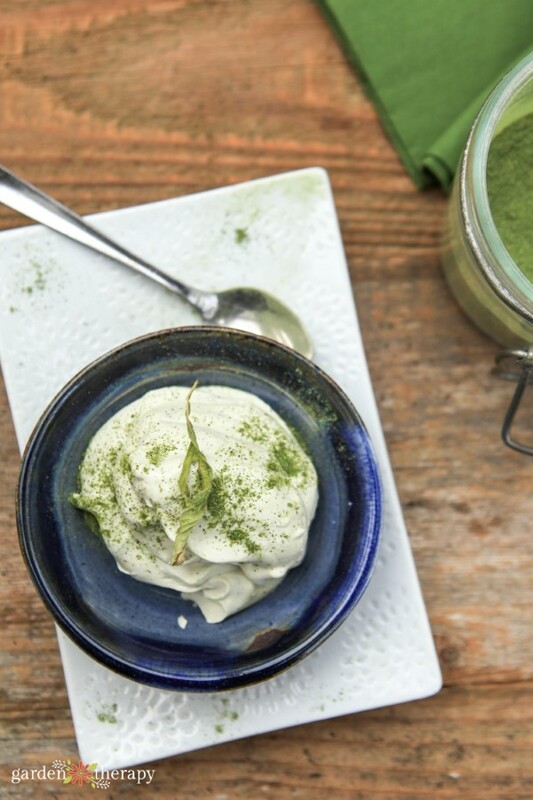 Check out the delicious coconut ice cream and melon dessert that Chef Andrea from Burdock & Co made from my garden stevia when I hosted a garden-to-table event there last year. 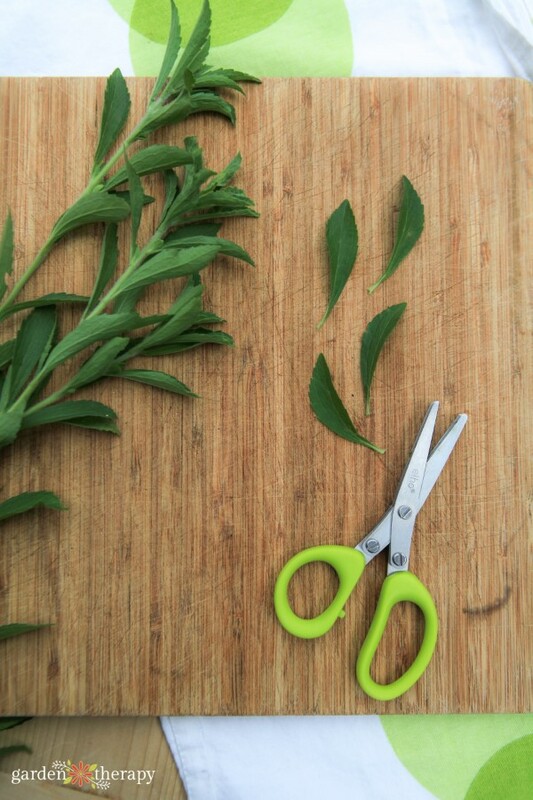 Remove the leaves from the stems and use the leaves to make fresh tea or liquid extract. You can also dry the leaves by tying the stems and bundles and hanging them in a cool, dark place until the leaves dry. In the fall, harvest the entire plant after the weather has dipped. 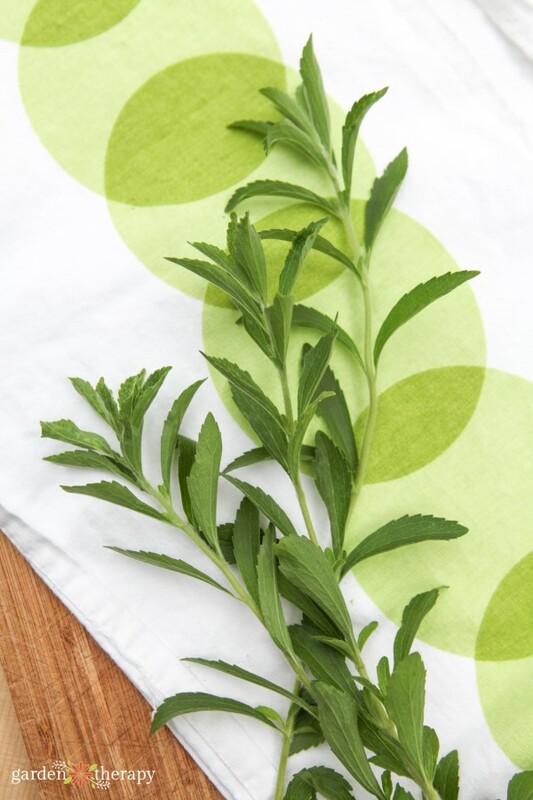 Cooler temperatures enhance the sweetness of stevia leaves. Harvest green stevia in the morning when it has the highest sugar content. To dry stevia, cut the stems and bundle them together with garden twine. Hang them upside down on an herb drying rack in a cool, dark place out of direct sunlight. 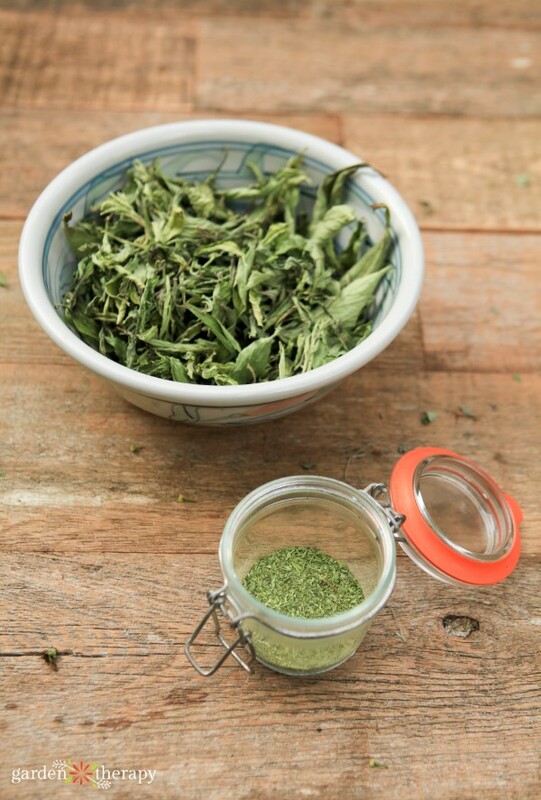 When there is no moisture left, you can remove the leaves and store them in Mason jars or grind them into a powder. 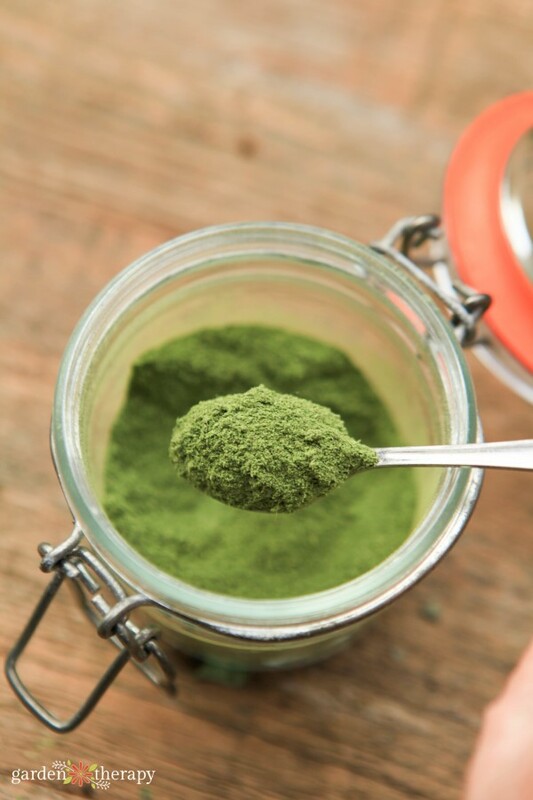 To make a green stevia powder that can be used in baking recipes, take the dried leaves and put them in a powerful blender or food processor (I use the “dry ingredient” attachment on my Vitamix) to create a very fine powder. Even though this powder may be quite fine, it will not dissolve in liquids but instead just float to the top, so you probably won’t want it use it in your morning coffee. I like to use it in baking and in recipes where it is dispersed throughout, like in a mousse. 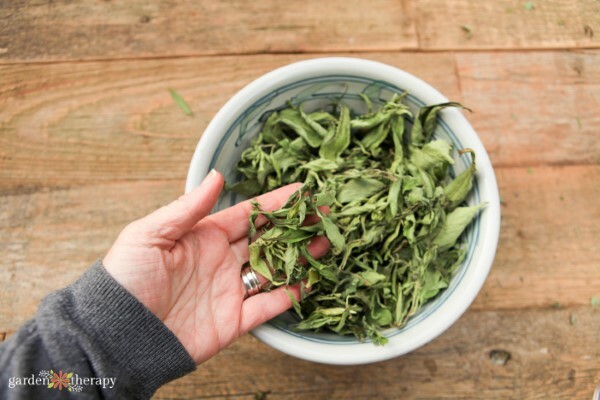 Use fresh or dried stevia leaves to sweeten tea. Add one small bit of leaf to hot water in combination with your other tea herbs to add a natural, earthy sweetness. Stevia will not steep in cold water so the water must be warm in order to release the sweetness. Always keep in mind that stevia is so much sweeter than sugar that you only need a little bit as it will go a long way. Making an extract involves adding the stevia leaves to a liquid to draw out the flavors. You then strain out and discard the leaves, leaving you with a sweet stevia extract that is easy to use in liquids like tea, soda, smoothies, and other recipes where powdered stevia would not dissolve. I like this recipe for making stevia extract because you can make it in alcohol, but there are also instructions on how to dealcoholize it if you wish. I hope that stevia changes your life for the better as it did mine. Let me know in the comments how you use stevia and feel free to share your favorite recipes! So I’m in NH.Since it’s too late to start a garden, is there a company that I can buy the green stevia from? I had tried stevia powder a while back and couldn’t get used to the underlying bitter taste. Oh, thank you! I think I’ll do both. We’re planning on starting our first garden in this home this spring. I’ll definitely get stevia plants to grow. One other question: if I could find plants now, can they be grown indoors? Very nice post! I have been curious in sugar substitutes and will definitely be growing stevia this year! Thanks for sharing your story and insight!